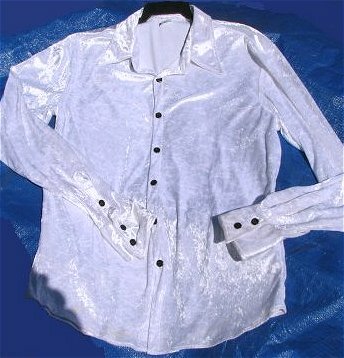 This shirt is made of an extremely shiny very lightweight thin white velvet. The stretch velvet is so thin that a performer could wear it. The shirt is a roomy size 50 and it might be a bit long too. The never worn shirt is washable on gentle.